The Plasma desktop has many virtues. It's elegant, stylish, and you can customize the living daylights out of it, if such a need grabbeth thy heart. But then, side by side with this modern, sleek look, you get some rather odd ergonomic choices. 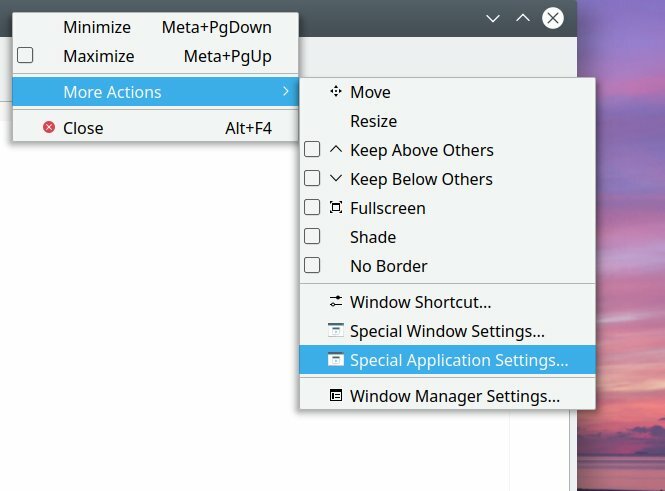 Like the fact that Plasma does not have a simple toggle to allow you to save window positions for your applications. Start a program, and it's always placed in the top left corner. In this tutorial, I will show you how you can work around this issue. And that way, you will achieve the expected functionality, which exists elsewhere, of being able to have your programs start with the size and position that you want, every time, whether you choose to save the desktop session or not. After me. 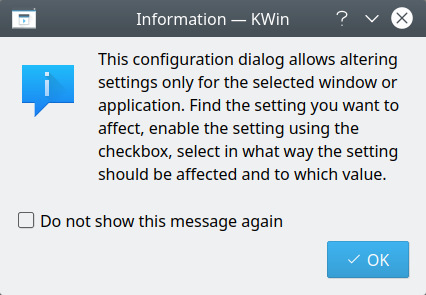 All right, so you want Plasma to remember window positions? The change, at the moment, cannot be applied globally. It can be effected per-application. Start a program that you want to save position thereof, e.g. a browser that does not span the full desktop width and is centered, or alike. This will open a separate window (with a warning), where you can override numerous settings. There are four different tabs, but we need the second one that reads Size & Position. By default the check boxes next to the Position and Size settings will not be marked. Mark them, and then, in the drop down box, change Do Not Affect to Remember. Click OK. And from now on, the specific program will launch in the exact same spot, and with the exact same dimensions as you've chosen from last time. There you go. Hopefully, one day, you will not be needing this article, as the tips shown here will have been obsoleted by new features being introduced into the Plasma desktop, which will also include last position restore on application start. Meanwhile, you have this. If you still feel daunted by Plasma, don't be. Or better yet, why don't you send an email or three, and ask for additional topics and ideas to be explored. After all, innovation comes from problem solving. If there are no issues, there can be no learning. Take care.